Presented by Independent Shakespeare Co., the Griffith Park Free Shakespeare Festival is the largest summer theater event in the City of Los Angeles. This year ISC is offering over 40 nights of programming beginning June 28 with Shakespeare’s rarely-produced romance, The Winter’s Tale, directed by Sanford Robbins. Alongside that are two of his most popular comedies, A Midsummer Night’s Dream (opening Thursday, July 5) and The Comedy of Errors (opening Thursday, August 2), both directed by ISC Artistic Director, Melissa Chalsma who will also take the stage as Titania in A Midsummer Night’s Dream. The 2011 season boasted record attendance of more than 25,000, making it the largest summer theater event in the City of Los Angeles and the largest Shakespeare Festival in Los Angeles. ISC builds its festival stage at the site of the Old Zoo (near the Carousel), a natural amphitheater conveniently located next to ample parking. In addition to the productions, there are nine PLAYERS IN THE PARK/ JUGAMOS EN EL PARQUE pre-show workshops on select evenings. These workshops are an interactive, entertaining way for families to learn about the evening’s performance. Led by ISC Teaching Artists, workshop participants learn about Shakespeare’s language, theatrical staging, and what to look for in the play they will be seeing. They also get to speak lines of dialogue from the stage, and have a backstage tour and meet the actors. Do you ever feel that something in your life is missing? The Mediterranean Island of Ephesus at the tail end of WWII is a dangerous place. Locked in a battle with neighboring Syracuse, the town is suspicious of strangers. Into this place, two men come to town seeking to find themselves, but inadvertently cut a path of chaos. During the upheaval, love is lost and found, lives are saved, and a community is restored. A live band and period dancing complete Shakespeare’s most compact and fast-paced comedy. Scenic design is by Caitlin Lainoff; costumes by Kate Bishop; and lighting by Bosco Flanagan. Special pre-show performances will also take place on select evenings at 6:30 pm. Mariachi Los Toros (Thurs, July 12), Invertigo Dance Theatre: Cupid Painted Blind (Sun, 7/22; Thurs, 7/26; Sun, 8/5; Sun, 8/12; Thurs, 8/16), The Jumbo Shrimp Circus (Fri, 8/17; Thurs, 8/23; Thurs, 8/30). The Salon Series features Discussions at the Intersection of Shakespeare and Contemporary Culture. Salon Series events meet under a tree in the performance area at 6:00 pm. Shakespeare Now with Sanford Robbins (Sat, 6/30). Shakespeare and the Science of Chaos with Claire Marie-Peterson (Sat, 8/4). Reservations are recommended for the Salons: cronk@iscla.org or call (818) 710-6306. 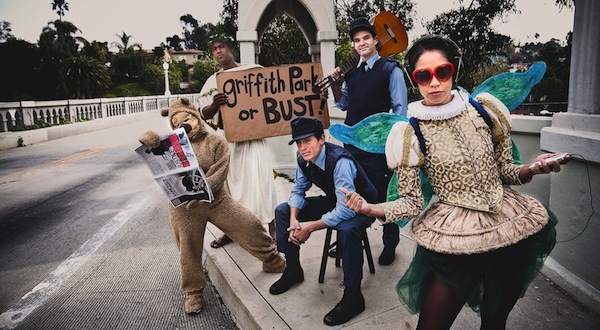 Griffith Park FREE Shakespeare Festival runs June 28 – Sept 2, Thursdays through Sundays at 7 pm. The Festival is located in The Old Zoo at Griffith Park (near 4730 Crystal Spring Dr.) GPS Coordinates of the parking area: 34*8.034’N, 118* 17.100‘W. Visit www.iscla.org or call (818) 710-6306 for directions and information. PLEASE NOTE: There is no seating at the site. Please bring a blanket or low-backed chair. It is also very cool when the sun goes down. Dress warmly.